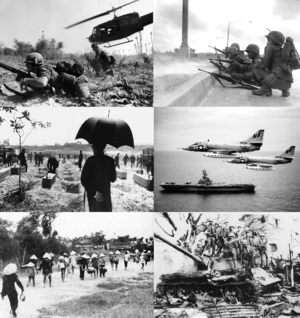 Clockwise, from top left: U.S. combat operations in Ia Drang, ARVN Rangers defending Saigon during the 1968 Tet Offensive, two A-4C Skyhawks after the Gulf of Tonkin incident, ARVN recapture Quảng Trị during the 1972 Easter Offensive, civilians fleeing the 1972 Battle of Quảng Trị, and burial of 300 victims of the 1968 Huế Massacre. වියට්නාම් යුද්ධය (වියට්නාම්: චියෙං චං වියට් නාම්), දෙවන ඉන්දුචින යුද්ධය, ඇමෙරිකාවට එරෙහි ප්‍රතිරෝධී යුද්ධය හෝ සරලව ඇමෙරිකානු යුද්ධය ලෙස හැඳින්වෙන්නේ සීතල යුද්ධය-යුගය තුල, 1955 නොවැම්බර් 1 වන දින සිට[A 1] 1975 අප්‍රේල් 30 දිනදී සයිගොං යටත්වීම දක්වා වියට්නාමය, ලාඕසය, සහ කාම්බෝජය යන රටවල් තුල පැවති හමුදාමය ගැටුමකි. ඉන්දුචින යුද්ධ වලින් දෙවැන්න වූ එම සටන නිලවශයෙන් උතුරු වියට්නාමය සහ දකුණු වියට්නාම රජය අතර පැවතුණි. උතුරු වියට්නාම හමුදාවට සෝවියට් සංගමය, චීනය සහ අනෙකුත් කොමියුනිස්ට් රටවල සහාය ලැබුණු අතර දකුණු වියටනාම හමුදාවට එක්සත් ජනපද, දකුණු කොරියාව, ඔස්ට්‍රේලියාව, තායිලන්තය සහ වෙනත් කොමියුනිස්ට්-විරෝධී රටවල සහාය ලැබුණි. එනිසා එම යුද්ධය, සිතල යුධ සමයේ අතුරු යුද්ධය (proxy war) ක් ලෙස සළකනු ලැබේ. එම යුද්ධය එක්සත් ජනපදයට සිදු වූ අවමානයක් ලෙස සළකනු ලැබේ. උතුරු වියට්නාමයේ සහාය ලද වියට්කොන්ග් නමැති දකුණු වියට්නාමිය කොමියුනිස්ට් පෙරමුණ එම කලාපයේ කොමියුනිස්ට් විරෝධී බලවේග වලට එරෙහිව ගරිල්ලා යුද්ධයක් ඇති කරන ලදී. එහිදී උතුරු වියට්නාම හමුදාව ලෙසටද හැඳින්වෙන වියට්නාම මහජන හමුදාව, විශාල හමුදා ඒකක සටනට යොදවමින් සම්ප්‍රධායික යුධමය තත්ත්වයක් ඇති කරන ලදී. යුද්ධය දිගටම ක්‍රියාත්මක වන්නට වූ විට වියට්කොන්ග් වරුන්ගේ යුධමය ක්‍රියා අඩු වූ අතර උතුරු වියට්නාම හමුදාවේ ක්‍රියාකාරිත්වය වර්ධනය විය. එක්සත් ජනපද සහ දකුණු වියට්නාම හමුදා ගුවන් ගුවන් බලය සහ ගිනි අවි බලය පිලිබඳ විශ්වාසය තබමින් පාබල හමුදා, ආටිලරි සහ ගුවන් ප්‍රහාර මගින් සෙවීමේ සහ විනාශ කිරීමේ මෙහෙයුම් ක්‍රියාත්මක අක්රන්නට විය. යුද්ධයේදී එක්සත් ජනපද මගින් උතුරු වියට්නාමයට එරෙහිව මහා පරිමාණ උපක්‍රමශීලී බෝම්බ මෙහෙයුම් ක්‍රියාත්මක කරන ලදී. උතුරු වියට්නාම රජය සහ වියට්කොන්ග් සටන් වැදුණේ වියට්නාමය නැවත එක් කිරීම සඳහාය. ඔවුන් එම යුද්ධය සළකන ලද්දේ ප්‍රංශය සහ එක්සත් ජනපදය සමග පැවති පළමු ඉන්දුචින යුද්ධයේ දිගුවක් සහ යටත්විජිතවාදී යුද්ධයක් ලෙසටය. යුද්ධයට එක්සත් ජනපදයේ මැදිහත්වීම, එක්සත් ජනපද රජය විසින් සළකන ලද්දේ කොමියුනිස්ට්වාදීන් දකුණු වියට්නාමය අත්පත් කරගැනීම වැළක්වීමේ මාවතක් ලෙසිනි. මෙය, කොමියුනිස්ට්වාදය පැතිරයාම වැළක්වීම අරමුණු කරගත් පුළුල් වළකාලීමේ පිළිවෙතක එන ඩොමිනෝ සංකල්පයේ කොටසකි. 1950 ආරම්භයේ පටන් ඇමෙරිකානු යුධ උපදේශකයන් එවකට ප්‍රංශ ඉන්දුචිනයට පැමිණියහ. ප්‍රංශ යුධ ක්‍රියාන්විතය සඳහා ආධාර බොහෝමයක් එක්සත් ජනපදය විසින් සපයන ලදී. 1960 මුල් භාගයේදී එක්සත් ජනපද මැදිහත්වීම වර්ධනය වූ අතර 1961 දී සහ 1962 දී යුධ බල ඇණි ප්‍රමාණය තෙගුණ කරන ලදී. 1964 ටොන්කින් ගල්ෆ් සිදුවීමෙන් පසු එක්සත් ජනපද මැදිහත්වීම තවදුරටත් වැඩි විය. එහිදී ඇමෙරිකානු යාත්‍රාවක් උතුරු වියට්නාම වේග ප්‍රහාරක යානාවක් මගින් විනාශ වීම නිසා ටොන්කින් ගල්ෆ් යෝජනාව මගින් එක්සත් ජනපද හමුදා සහභාගිත්වය වැඩි කිරීමට එකසත් ජනපද ජනාධිපති අවසරය ලබා දෙන ලදී. 1965 පටන් සාමාන්‍ය එක්සත් ජනපද හමුදා ඛණ්ඩ මෙහෙයුම් වලට එකතු කරන ලදී. ජාත්‍යන්තර දේශසීමා ඉක්මවමින් ද මෙහෙයුම් ක්‍රියාත්මක වන්නට විය. ලාඕසයේ සහ කාම්බෝජයේ දේශසීමා ප්‍රදේශ උතුරු වියට්නාමය විසින් සැපයුම් ප්‍රදේශ ලෙසට භාවිත කරන ලදී. 1968 වනවිට යුද්ධයට ඇමෙරිකාවේ සහභාගිත්වය උපරිමයකට ලඟා වී තිබුණෙන් එම ප්‍රදේශ දැඩි ලෙස ඇමෙරිකානු බෝම්බ ප්‍රහාරයට ලක්වන්නට විය. 1968 දී කොමියුනිස්ට්වාදී පාර්ශ්වය විසින් Tet Offensive දියත් කරන ලදී. Tet Offensive හි අරමුණ වූයේ දකුණු වියට්නාම රජය බලයෙන් පහ කිරීමයි. එම අරමුණ ඉටු නොවූ නමුදු Tet Offensive යුද්ධයේ හැරවුම් ලක්ෂ්‍යය බවට පත්විය. වසර ගණනාවක් පුරා දකුණු වියට්නාමයට දැවැන්ත ලෙස යුධ ආධාර සපයමින් යුද්ධය දිනන බවට ඇමෙරිකානු රජය සිදුකල ප්‍රකාශ මායාවක් බව Tet Offensive මගින් විශාල ඇමෙරිකානු ප්‍රජාවකට ඒත්තු ගන්වන ලදී. ක්‍රමිකව ඇමෙරිකානු හමුදා ඉවත් කර ගැනීම "වියට්නාමිකරණයේ" කොටසක් ලෙසට ඇරඹුණු අතර එමගින් ඇමෙරිකාව යුද්ධයෙන් ඉවත් වී කොමියුනිස්ට්වරු සමඟ යුද්ධ කිරීම දකුණු වියට්නාමයට පවරන ලදී. 1973 ජනවාරි මස සියළු පාර්ශව විසින් පැරිස් සාම සම්මුතිය අත්සන් තැබුවද එය නොතකා සටන් තවදුරටත් පැවතුණි. එක්සත් ජනපදයේ සහ බටහිර ලෝකය තුළ විශාල ප්‍රතිසංස්කෘතියක කොටසක් ලෙස දැවැන්ත වියට්නාම යුධ විරෝධී ව්‍යාපාරයක් ගොඩ නැගුණි. එක්සත් ජනපද හමුදා වල ඍජු මැදිහත්වීම් 1973 අගෝස්තු 15 අවසන් විය. උතුරු වියට්නාම හමුදාව 1975 අප්‍රේල් වලදී සයිගොන් අත්පත් කරගැනීම, යුද්ධයේ නිමාව සනිටුහන් කරන ලදී. ඊට පසු වසරේ දී උතුරු සහ දකුණු වියට්නාමය නැවත එක් කරන ලදී. යුද්ධය නිසා විශාල පිරිසකගේ ජිවිත අහිමි විය. ඇස්තමේන්තුගත වියට්නාම සොල්දාදුවන් සහ සිවිල් වැසියන්ගේ ජිවිත හානි වීම් ගණන 966 000 - මිලියන 3.1 තරම් පරාසයක පවතී. 240 000 සිට 300 000 දක්වා වූ කාම්බෝජ වැසියන් පිරිසකගේ ද 20 000 සිට 62 000 දක්වා වූ ලාඕස වැසියන් පිරිසකගේ ද ජිවිත යුද්ධය නිසා අහිමි විය. එක්සත් ජනපද හමුදා භටයින් 58 220 කගේ ජිවිත යුද්ධය නිසා අහිමි වූ අතර 1 626 දෙනෙකු ක්‍රියාන්විතයේදී අතුරුදන් වූවන්ගේ ලැයිස්තුවට ඇතුළත් වී ඇත. ↑ 2.0 2.1 2.2 2.3 2.4 2.5 "Allies of the Republic of Vietnam". සම්ප්‍රවේශය 24 September 2011. ↑ "Chapter Three: 1957–1969 Early Relations between Malaysia and Vietnam" (PDF). University of Malaya Student Repository. p. 72. සම්ප්‍රවේශය 17 October 2015. ↑ "Tunku Abdul Rahman Putra Al-Haj (Profiles of Malaysia's Foreign Ministers)" (PDF). Institute of Diplomacy and Foreign Relations (IDFR), Ministry of Foreign Affairs (Malaysia). 2008. p. 31. ISBN 978-9832220268. Archived (PDF) from the original on 16 October 2015. සම්ප්‍රවේශය 17 October 2015. The Tunku had been personally responsible for Malaya's partisan support of the South Vietnamese regime in its fight against the Vietcong and, in reply to a Parliamentary question on 6 February 1962, he had listed all the used weapons and equipment of the Royal Malaya Police given to Saigon. These included a total of 45,707 single-barrel shotguns, 611 armoured cars and smaller numbers of carbines and pistols. Writing in 1975, he revealed that "we had clandestinely been giving 'aid' to Vietnam since early 1958. Published American archival sources now reveal that the actual Malaysian contributions to the war effort in Vietnam included the following: "over 5,000 Vietnamese officers trained in Malaysia; training of 150 U.S. soldiers in handling Tracker Dogs; a rather impressive list of military equipment and weapons given to Viet-Nam after the end of the Malaysian insurgency (for example, 641 armored personnel carriers, 56,000 shotguns); and a creditable amount of civil assistance (transportation equipment, cholera vaccine, and flood relief)". It is undeniable that the Government's policy of supporting the South Vietnamese regime with arms, equipment and training was regarded by some quarters, especially the Opposition parties, as a form of interfering in the internal affairs of that country and the Tunku's valiant efforts to defend it were not convincing enough, from a purely foreign policy standpoint. ↑ "Cesky a slovensky svet". Svet.czsk.net. සම්ප්‍රවේශය 24 February 2014. ↑ "Bilaterální vztahy České republiky a Vietnamské socialistické republiky | Mezinárodní vztahy | e-Polis – Internetový politologický časopis". E-polis.cz. සම්ප්‍රවේශය 24 February 2014. ↑ "Project MUSE – l Sailing in the Shadow of the Vietnam War: The GDR Government and the "Vietnam Bonus" of the Early 1970s" (PDF). ↑ "Stasi Aid and the Modernization of the Vietnamese Secret Police". 20 August 2014. ↑ 14.0 14.1 Radvanyi, Janos (1980). "Vietnam War Diplomacy: Reflections of a Former Iron Curtain Official" (PDF). Paramaters: Journal of the US Army War College. Carlise Barracks, Pennsylvania. 10 (3): 8–15. ↑ "Why did Sweden support the Viet Cong?". HistoryNet. 25 July 2013. සම්ප්‍රවේශය 20 July 2016. ↑ "Sweden announces support to Viet Cong". HISTORY.com. සම්ප්‍රවේශය 20 July 2016. In Sweden, Foreign Minister Torsten Nilsson reveals that Sweden has been providing assistance to the Viet Cong, including some $550,000 worth of medical supplies. Similar Swedish aid was to go to Cambodian and Laotian civilians affected by the Indochinese fighting. This support was primarily humanitarian in nature and included no military aid. ↑ Tucker, Spencer (2011). The Encyclopedia of the Vietnam War: A Political, Social, and Military History, 2nd Edition. ABC-CLIO. පි. xlv. ISBN 978-1851099610. https://books.google.com/?id=qh5lffww-KsC&pg=PR45&lpg=PR45&dq=peak+us+strength+vietnam+war#v=onepage&q=peak%20us%20strength%20vietnam%20war&f=false. ↑ 25.0 25.1 The A to Z of the Vietnam War. The Scarecrow Press. 2005. ISBN 978-1461719038. https://books.google.com/?id=4VG4AQAAQBAJ&pg=PA11&lpg=PA11&dq=troops+both+sides+in+vietnam+war#v=onepage&q=troops%20both%20sides%20in%20vietnam%20war&f=false. ↑ "China admits 320,000 troops fought in Vietnam". Toledo Blade. Reuters. 16 May 1989. සම්ප්‍රවේශය 24 December 2013. ↑ Roy, Denny (1998). China's Foreign Relations. Rowman & Littlefield. පි. 27. ISBN 978-0847690138. ↑ 30.0 30.1 Womack, Brantly (2006-02-13). China and Vietnam. ISBN 978-0521618342. https://books.google.com.vn/books?id=GaZvX2BzeegC&pg=PA176. ↑ Pham Thi Thu Thuy (1 August 2013). "The colorful history of North Korea-Vietnam relations". NK News. සම්ප්‍රවේශය 3 October 2016. ↑ 33.0 33.1 33.2 Lewy 1978, pp. 450–53. ↑ "America's Wars Fact Sheet" (PDF). සම්ප්‍රවේශය 29 November 2017. ↑ "Australian casualties in the Vietnam War, 1962–72 | Australian War Memorial". Awm.gov.au. සම්ප්‍රවේශය 29 June 2013. ↑ "Overview of the war in Vietnam | VietnamWar.govt.nz, New Zealand and the Vietnam War". Vietnamwar.govt.nz. 16 July 1965. Archived from the original on 26 July 2013. සම්ප්‍රවේශය 29 June 2013. ↑ "America Wasn’t the Only Foreign Power in the Vietnam War". සම්ප්‍රවේශය 10 June 2017. ↑ "Chapter III: The Philippines". History.army.mil. Archived from the original on 29 October 2013. සම්ප්‍රවේශය 24 February 2014. ↑ "Asian Allies in Vietnam" (PDF). Embassy of South Vietnam. March 1970. සම්ප්‍රවේශය 18 October 2015. ↑ "Chuyên đề 4 CÔNG TÁC TÌM KIẾM, QUY TẬP HÀI CỐT LIỆT SĨ TỪ NAY ĐẾN NĂM 2020 VÀ NHỮNG NĂM TIẾP THEO, datafile.chinhsachquandoi.gov.vn/Quản%20lý%20chỉ%20đạo/Chuyên%20đề%204.doc". ↑ "North Korea fought in Vietnam War". BBC News. 31 March 2000. සම්ප්‍රවේශය 18 October 2015. ↑ Shenon, Philip (23 April 1995). "20 Years After Victory, Vietnamese Communists Ponder How to Celebrate". The New York Times. සම්ප්‍රවේශය 24 February 2011. The Vietnamese government officially claimed a rough estimate of 2 million civilian deaths, but it did not divide these deaths between those of North and South Vietnam. උපුටාදැක්වීම් දෝෂය: "A" නම් කණ්ඩායම සඳහා <ref> ටැග පැවතුණත්, ඊට අදාළ <references group="A"/> ටැග සොයාගත නොහැකි විය. මේ පිටුව අන්තිමට සැකසුවේ 7 අප්‍රේල් 2018 දින දී, 14:57 වේලාවෙහිදීය.